Our journal continues the overview of the contenders for the title of “European boat of the year”, the announcement of winners will be at the international exhibition Boot Dusseldorf in 2019. In the previous two editions, we talked about the candidates in the classes of cruisers and racing cruisers. In this article we’ll talk about the nominees among the luxury cruise boats Luxury Cruiser. New 57-foot cruiser from Hallberg-Rassy was designed by the famous in the yachting industry architect Hermann Person. The boat is made in the traditional shipyard style and is equipped with secure cockpit, with a rest on the deck there is still a lot of space. Hallberg-Rassy 57 stands out among his fellow mounted a pair of wheels is typical of the creations shipyard tiller. The boat is equipped with lowerable bathing platform aft, which also features a roomy tender garage. 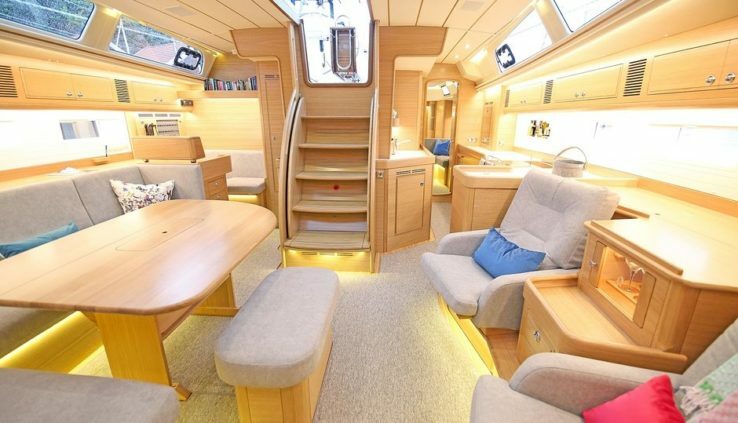 Below deck is a spacious salon, three double cabins and the engine room. For more comfort the owner’s Suite is located aft in the cabin so there is no narrowing, which is characteristic for nasal placement. Luxury cruiser from Sunbeam stands out narrowed to the aft body, which ensures a balanced and stable movement of the boat. Even in light winds the yacht can develop a decent speed thanks to the reduced length of the waterline. A nice bonus for the owner will be descending on the transom the swim platform, which is included in the basic package. 14,75-meter boat somehow offers just one plan but each element is thoroughly thought out. For guests there are two cabins with a shared bathroom at the stern, and an owner cabin with private restroom in the bow. For 42 Pilot Saloon from the French shipyard Wauquiez good saying “Small, but perfectly formed.” Family boat was presented at the last exhibition in Dusseldorf, and now she returns as the nominee. Cruiser was the smallest of the contenders in this class but he has something to boast about. First, the boat comes in two models with two and with three cabins (Charter version). Secondly, it is worth noting the natural lighting of the salon and cabins. Due to the large number of portholes and hatches of the day inside the boat plenty of light. In addition, the interior got large Windows providing 360 degree visibility. On the deck there is nothing superfluous. Everything can be hidden, tucked away in a box, and in the aft there is a large locker for storing rigging, fenders and other things. Detailed video review and test drive of this model Wauquiez is on our website.